I don’t know about you, but I love when I can find more earth-friendly products to use in my home! Have you been wanting to become more eco-friendly? 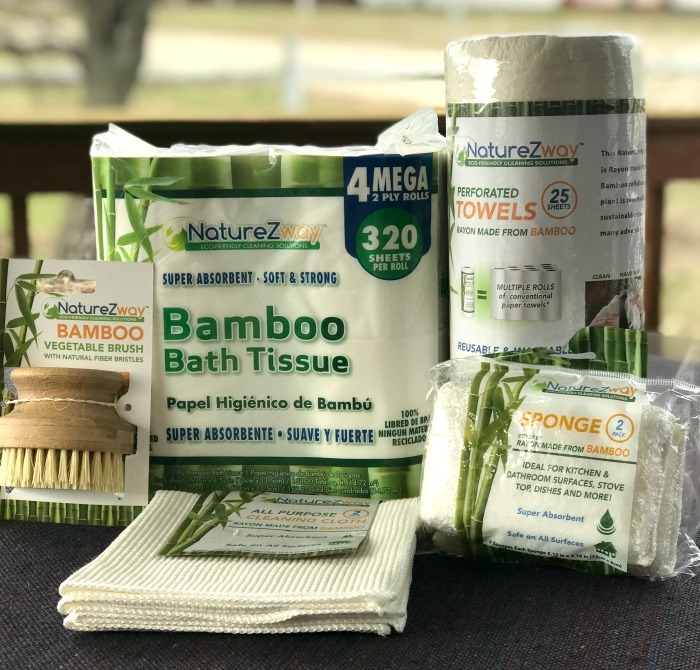 With products like Bamboo Bath Tissue, reusable and washable Bamboo Perforated Towels, reusable All Purpose Cleaning Cloths and sponges, and a Bamboo Vegetable Brush you can become more eco-friendly and you may even find you save a few dollars in the process! Be sure to read our full review here and then, we have a wonderful opportunity for you to win an assortment of these fabulous eco-friendly products! NatureZway Eco-Friendly Cleaning Products Prize Pack! Giveaway ends 4/8/19 at 11:59 pm ET! Open to US residents 18+ and older. I’d most like trying the bath tissue! I am most excited for the bamboo towels and the veggie brush. Most excited to try the bamboo towels. The vegetable brush to scrub those veggies for grilling! I’d like to try the bamboo bath tissue. Does that sound weird? I would love to try the washable bamboo perforated towels. The bamboo bath tissue looks really nice! I would be really excited to try it! I would love to try the sponge. The washable bamboo perforated towels. This would save me a lot of time and money (and aggravation). I am most excited to try the Perforated Towels from NatureZway. I’d like to try the Bamboo Bath Tissue which I imagine is quite different from the bamboo in survival training. I would love to try the Bamboo Towels that are washable. The toilet tissue sounds nice, also. I’d love to try the vegetable brush!! I love all the items and would love to try each and every one. The one I’d most like to try is the bamboo veggie brush.